He is also using the Games as a stepping stone to qualify for the 2020 Tokyo Olympics - where he says he will “fight” to win a historic gold for Fiji. Winston Hill, Fiji’s top amateur boxer, wants to become the best in the Pacific– and eventually the world. Coming off a bronze medal win at the 2018 Gold Coast Commonwealth Games, Hill has his set his sights on claiming gold at July’s Pacific Games in Samoa. The diminutive boxer is ranked 20th in the world in the 69kg category, having fought 73 amateur fights with 61 wins and 12 losses. He is also using the Games as a stepping stone to qualify for the 2020 Tokyo Olympics – where he says he will “fight” to win a historic gold for Fiji. The 25-year-old is yet to win a gold medal at a major regional competition and sees victory in Samoa as a way to stamp his mark in the Pacific, before moving on to bigger things. He settled for silver in the 69kg category at the 2015 Pacific Games in Papua New Guinea and bronze two years later at the Pacific Mini Games in Vanuatu. Then came the bronze medal fight in Gold Coast, Australia – a huge achievement considering it happened only four years after he took up the sport. The memory of that semi-final loss, to Northern Ireland’s Aidan Walsh, remains firmly on Hill’s mind as he prepares for the Games and the 2020 Olympics. “Not so much the loss but the strategy to overcome Walsh’s agile style of fighting, which involves a lot of movement where the boxer is always running and jabbing,” Hill said. The death of Hill’s former trainer, Napoleon Taumoepeau, last year, was a loss that still affects him. Taumoepeau coached Hill to the Rio Olympics in 2016 and also played a role in inspiring the boxer to take up the sport at a competitive level. “I don’t really like to talk about it but his death has put a hole in my life and has affected me on a lot of levels, including my boxing career,” he said. Hill is currently training under renowned trainer and world boxing hall of famer Johnny Lewis, who will be in the country next week for the Fiji Games. Lewis has trained several world champions – including world boxing hall of famer Jeff Fenech, former WBC light heavyweight champion Jeff Harding and former world light welterweight champion Kostya Tszyu. Hill’s training camps with Lewis in Australia usually run for two to six weeks, during which he has access to quality sparring partners and world class training facilities. But financial constraints and finding the time to train between working to establish his own gym in Fiji has been Hill’s greatest challenges. “Starting a business, especially a gym, is not an easy thing. You have to be hands-on all the time if you want to maintain standards and run it smoothly. I don’t have time for anything else,” he said. Despite the challenges, Hill’s dedication and commitment has been recognised by the Fiji Amateur Boxing Association and the Fiji Association of Sports and National Olympic Committee. Both organisations back him with financial support to attend training camps overseas in recognition of the boxer’s talent. Eventually, Hill plans to turn professional – possibly after the Olympics – but that step is still far off. For now, he remains singularly focussed on achieving success for Team Fiji in Samoa and Tokyo next year. Hill will need to win gold or silver at the Oceania Championships in August to qualify for the Olympics. 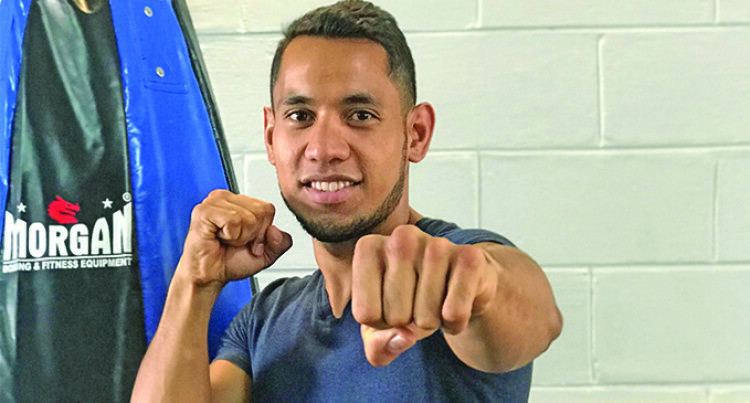 Before that, boxing fans will get a chance to watch Hill fight next week during the Fiji Games, which will serve as the final Pacific Games trials. In Samoa, his journey to reach the pincle of amateur boxing will begin to officially take shape – in what is set to be a huge two years leading up to Tokyo. If all goes well, Hill will get a chance to compete against the best amateur fighters in the world. He will get a chance to realise his dream. For some boxers, talent alone is enough. For others, the right attitude is key. When one has both, his name tends to remain in lights for a long time. Hill says he still has a long way to go. He doesn’t think the lights are shining on him too brightly just yet.